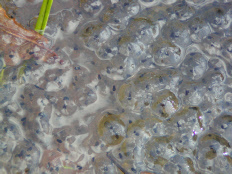 The woods are not just home to the furry and feathered animals but also to scaly and slippery. 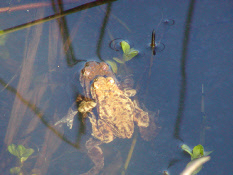 Although a number of new ponds have been created by volunteers over the last few years, providing welcome extra habitat, amphibians have always been present in the woods where many of them spend the terrestrial phase of their lives before they emerge to venture to their breeding waters. 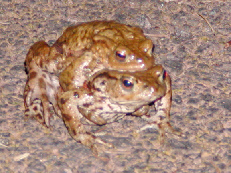 Every spring, Common Toads emerge from their winter hibernacula in the woods and many cross the Draethen to Michaelston Road on their way to Ironbridge Cottage pond where they spawn. Breeding is such an important activity that they will risk being pancaked in order to do so. 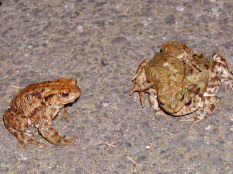 Toads cross the road night and day - and will often stop to soak up the heat of its sun-warmed surface. However, the main movement is always after dusk, and numbers can be so great that drivers simply cannot avoid squashing them –sometimes dozens at a time can be killed by just one car. 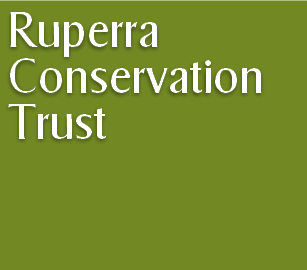 In the interests of keeping this population safe, the friends and volunteers of Ruperra go out on Toad Patrol each year on damp March evenings to assist these slippery pedestrians across the roads. 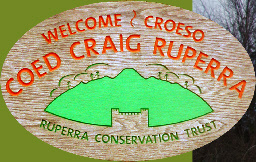 Over the last 3 years they have successfully helped move over 4000 toads, plus several newts and the odd frog. 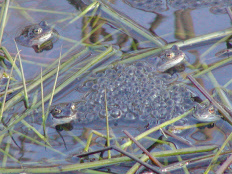 Ponds are also important to Grass Snakes, which can sometimes be seen swimming across them in search of a froggy meal! 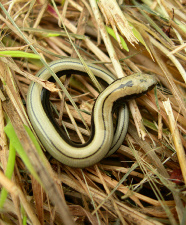 You may sometimes come across one basking on a warm secluded path on the site, or hear the gentle rustle as it slithers away into the undergrowth. 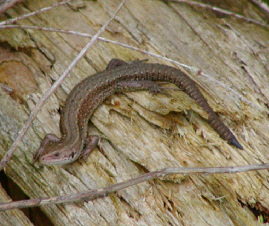 Also occasionally spotted warming up on a log is the Common Lizard while Slow Worms are often found underneath a discarded piece of wood or rotting bark.